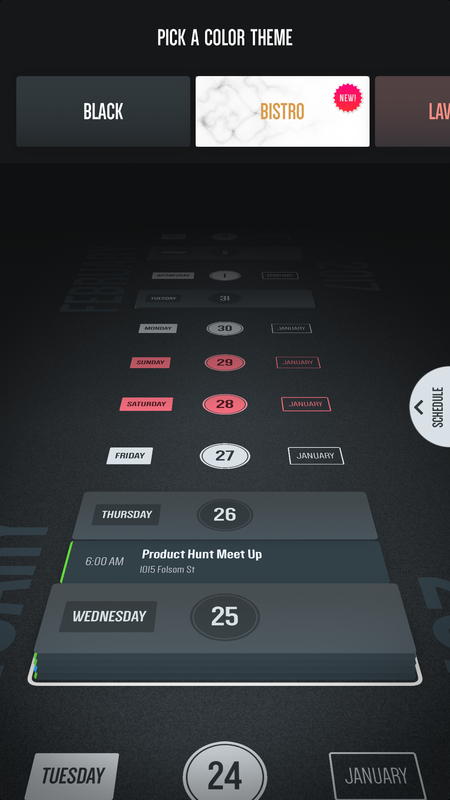 Vantage is a calendar designed for people who like to think and understand things visually. A lot of attention has been taken to present time in intuitive ways using perspective, color and motion. And it's resulted in some pretty interesting UX solutions. Vantage Calendar Is a More Visual Way to View Your CalendarTap any date and you'll get a stack of info for the day or week that looks a little closer to any other calendar app around. Vantage Calendar Is a More Visual Way to View Your CalendariOS: Calendar apps are usually pretty boring, sticking to the time honored grid or list view to display data. That's probably the best for anyone with a lot to manage, but Vantage Calendar takes an altogether new approach that's worth a look if your schedule isn't always packed. Would you recommend Vantage: Calendar & To-dos to a friend? @gabriel__lewis personally I find this a little too "over the top" in terms of random flashy things. I'm partial to Moleskine's Timepage (https://www.producthunt.com/post...) which also has visual manifestations of how busy you are that day, but it's a lot cleaner. It's like a student's Dribbble post come to life! This looks amazing, and I would use it, but any short or long term plans to get this on Android?